It's Tarot Tuesday! 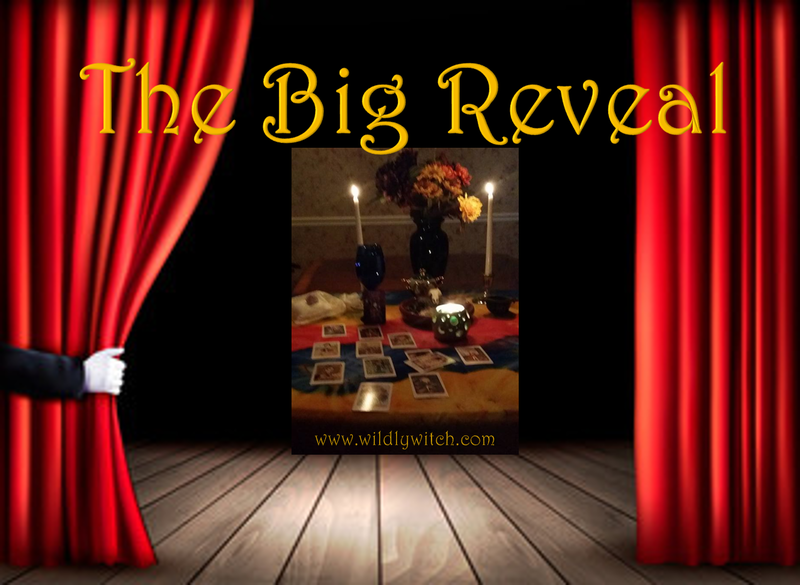 Are you ready for the Big Reveal? We're getting right to it today. Let's see if you notice anything peculiar about the four cards today. Make sure you comment on the Facebook Page if you find it! The Queen of Pentacles signals that you are either enjoying a time now of being taken care of or are happily taking care of someone. 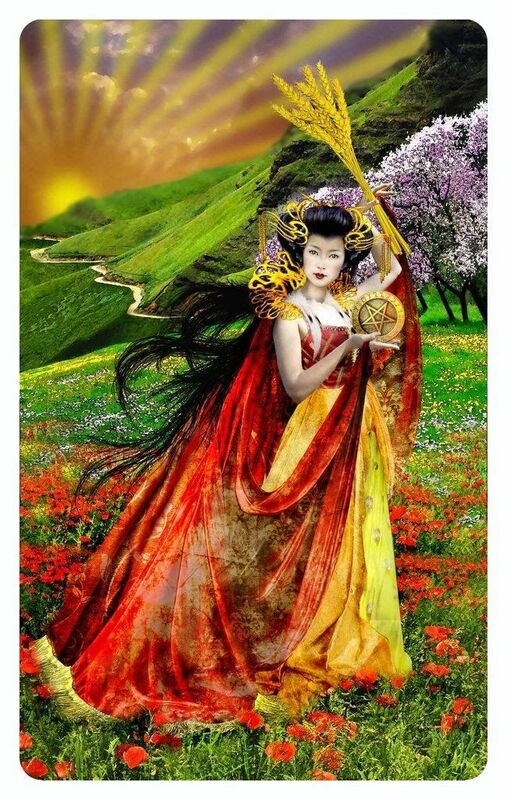 The card's presence again demands that you assess your situation to receive the message – is this Queen someone who is currently making your life a little easier and providing for you or are you the person making sure that someone special is being nurtured. Success is yours if you are prepared to work hard for it, You are financially secure, The money will come in, You will be able to hold on to your money, Finances are definitely improving, Your business will be a success, There is plenty to go around. You have a way with children and animals.Spend more time at home; try decorating or cooking. Your pets mean a lot to you; help out at an animal rescue shelter, Grow your own food: eat healthy, and mind what you put in your body, Time for some gardening, get out and about into nature, Get some exercise and fresh air. All of these messages are attached to this Queen. Is it time to get real? Would a practical way of solving problems make sense now? Have a few people recently remarked about how dependable you have become? If these words ring true, your Tarot reading is probably taking place with the Page of Pentacles card being drawn. This is a card of seeing the light in all that is practical, and realistic. The Page of Pentacles signals the moment when those who have integrity begin to use this moral backbone to rise and take charge. As events turn in your favor, the energy of this card creates prosperity commensurate with your commitment to upholding the truth. In the present position, the Page of Pentacles indicates that you are only now coming to certain terms about the real world. 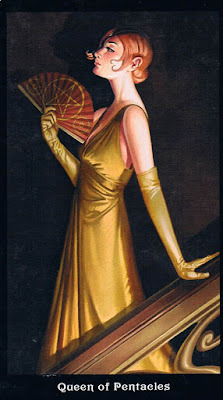 This is a good place for the card to land because in reference to your current state of affairs, you will be blessed with a calm and rational approach to all pressing problems. 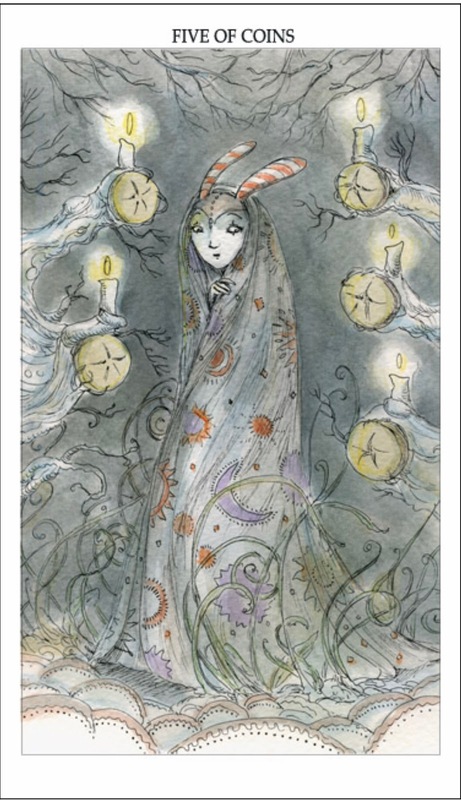 This is a good card to have if you are in a tense financial situation as it gives you the cleverness of a child with nothing to lose and everything to gain. Apply this approach to your income problems and you could be out of the red and into the black in no time. Think about what you want out of life. Success. Start Small But Think Big. Use the resources you have. Be proactive, Be realistic, Think practically, Be down to earth about the situation, Use your common sense in this instance, Be patient, Scrutinize all documents, contracts and paperwork, Make sure to read the small print, Pay special attention to your assets and possessions, Get outdoors and exercise, eat healthy, Be kind to animals, Think about the environment. These are the messages of this card. When the Five of Pentacles appears in the present part of a Tarot card spread, this tells you that you are not looking at a great opportunity that is right in front of you. Often this card appears in the present when a generous and loving man is letting you know that he would love to have you in his life and you are ignoring him as you follow a loser bad boy on a dead end fling. This card urges you to have faith and to see something in your life that is right in front of you that can lead to a much happier situation than the one in which you are currently embroiled. You may feel that you are struggling in the dark and panicked about your situation. Job losses and home repossessions are common. You may be homeless or in need of sheltered accommodation. With mounting debts and bills you may feel swamped and believe there is no way out of your predicament. Just putting food on the table could be a struggle, and if others are relying on you to provide for them, then you are likely to be in a very low place indeed. You could feel guilty and highly stressed about not being able to give your children or family the basics, as you watch them go without. Life may have narrowed down to a tiny pinhead of light leaving you lost and bewildered as to how to improve your circumstances. Help is out there for you if you are not too proud to ask. You need to be open about your situation and predicament instead of feeling ashamed or humiliated. There are many who will want to help make life a bit easier for you and give you advice on paying off debts but they won’t know of you unless you make the first contact. Negative Change in Circumstances, Financial or Material Loss, Financial burdens, Recession, Cursed, Bad Luck, World Against You, Loss,Lack, Scarcity, Misery, Hunger, Spiritual Hunger, Poverty, Hardship, Slow Progress, Struggling to make Ends Meet, Struggling On, Single Parent Struggles, Homelessness, Loneliness, Unemployment, Ruin,Bankruptcy, Debts, repossession, Damaged Goods, Struggling Business/Relationship, Broken Dreams, Desperation, Deprivation, Ruined Reputation, Social Outcast, Ostracized, Alienated, Out in The Cold, Rejection, Consequences, Charity, Being Charitable, Social Welfare, Pride, Fear of Scarcity Mentality, Health Problems, Illness, In Sickness and In Health, Separation/Divorce, Scandalous/Improper Relationship, Turning Away from The Material World, Giving up Everything. - These are the messages of this card. Have things stabilized recently? Are you enjoying the first stages of a new commitment that seems to be working out? Are others looking to you as a source of support and encouragement? Have you gotten through a series of tests, exams or obstacles recently and are more established than ever before? When you reach a plateau in life that confirms a feeling of competence and security in your outlook, expect the King of Pentacles to appear in your Tarot reading. This is the card that is the calm leader, the savvy businessperson, the adept engineer and the steady friend. 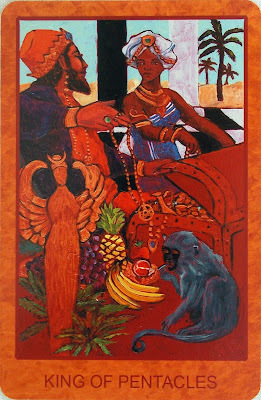 When it is in your Tarot reading, you mean all those things to the people in your life and have met your stated goals. When this card is in the present position you are bound to be feeling better about things. Perhaps you have pursued a Tarot reading because of this new sensation of calm. Peace and serenity are on their way if they are not already core components of your current existence. The King of Pentacles in this position offers you a unique opportunity to take stock of where you have been and what you want to do with your life. Success! Success = setting realistic goals and working relentlessly towards them, Think Success, You have what it takes to be a great success, Look out for golden opportunities, Take an idea and make it work, You have natural abilities and talents, Business is flourishing. Be proud of your achievements, Build from solid foundations, This is a solid place to invest, Money could double, The job on offer is wealth worth accepting, There is much wealth surrounding the issue, Someone has a lot of money, All the hard work will pay off, Be Reliable and Conscientious in your work, Handle this situation in a competent and practical manner, Buy quality goods even if it means having to save for them, Quality not quantity, Be patient and cautious in your approach, Pay attention to the details, Don’t take any unnecessary risks or gambles, Be generous with you time and experience, Help others achieve their success, Enjoy your success for you have earned it, Don’t become a workaholic, It is time to reap your rewards, Work when you work but make sure to rest when you rest, Set a healthy routine, Eat well and get plenty of exercise, Get out and about in nature, Sponsor an animal rescue center. These are all the messages of this card. How did you do? Are you seeing an improvement in your intuition since Jupiter went direct? What did you notice about this reading? As always, the best comments and support are found on the Facebook page, but feel free to reach out to me privately if you need more help. Happy Tuesday!